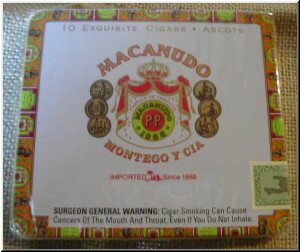 The Macanudo Baron de Rothschild is a good-looking cigar with lustrous brown color and a good cap. It's pleasant and rich with a buttery aroma. There is some pepper on the palate and light spices. Rated 89 points. A smooth, brown wrapper with a well-made cap. The cigar burns and draws well, with a malty aroma. It has notes of almonds and cedar, with a light spiciness. Rated 89. Well made, oily and shiny. It's mild and smooth, with sweet cream flavors and a slightly sharp finish. Rated 88. This fat toro has an easy draw and even burn. Despite its size, it's mild in body. Flavors are nutty and earthy with vegetal notes. The finish is mellow. 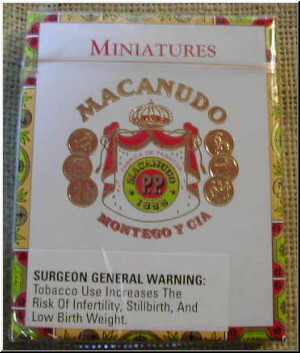 Rated 89 by the Cigar Insider. Rated 91. This big log of a cigar has a lush draw that delivers plenty of sweet, rich tobacco flavor, cocoa powder, earth and a touch of ginger. Very well-made cigar. It has a excellent flavors of sweet spice, and a pleasant earthy mustiness. Rated 88. A beautiful, light-brown wrapper. This robusto has an easy draw with an even burn. Soft spice flavors of coffee, cinnamon and nutmeg make an excellent medium-bodied cigar. Rated 91. This thin cigar has a coarse brown wrapper. It has cinnamon and sweet spice notes with a touch of cedar on the palate. Rated 87. A mild-to-medium bodied cigar. It has a solid core of light spicy flavors, and a pleasant cedary finish. Rated 88. Rated 88. Golden brown with a very well-made round cap. It is sweet with nut and wood notes. Traces of leather underscore a charred wood finish.